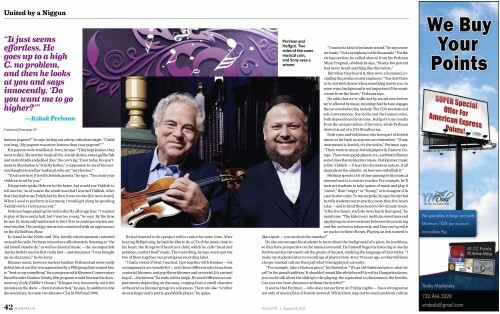 They both have roots in Poland and grew up in Tel Aviv, but the musical career paths of violinist Itzhak Perlman and Chazzan Yitzchak Meir Helfgot couldn’t have been more different — until those paths met a few years ago for a performance that took place, of all places, at the White House Lawn. Now they’ve joined forces once again, this time on a new CD that will be released by Sony Music on September 4. The behind-the-scenes story of this unusual collaboration. It’s not commonly known that the wife and children of violinist Itzhak Perlman enjoy regular Tanach study sessions with a teacher named Judy Geldzahler, whom Perlman describes as “quite frum.” One evening, Mrs. Geldzahler mentioned that she had to run out to a concert after the class. “Who’s giving the concert?” Toby Perlman, herself a musician, wanted to know. You might say that Perlman and Helfgot are two sides of the same Jewish musical coin. Although one wears casual button-down shirts and no yarmulke, while the other dons a long frock and tucks his pants into his socks, both are Israeli, from the Tel Aviv area, and both are from Polish backgrounds. Perlman was born to parents who left Poland in the 1930s, settling in Tel Aviv; Helfgot’s grandparents heeded the Gerrer Rebbe’s warning to get out of Europe, and also left in the 1930s, when his father was a little boy and his mother not yet born. 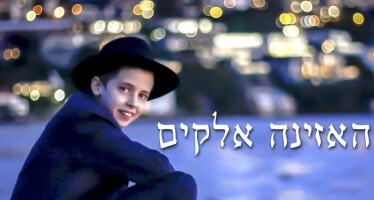 Perlman was discovered as a musical genius and brought to the US to study at the Juilliard School after his bar mitzvah; Helfgot, after becoming bar mitzvah, was sent to Jerusalem to learn in Yeshivas Sfas Emes. 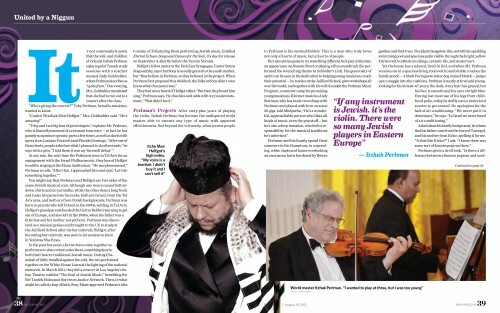 In the past few years, the two have come together as performers to share what unites them, something dear to both their hearts: traditional Jewish music. During Chanukah of 2010, bundled against the cold, the two performed together on the White House Lawn at the lighting of the national menorah. In March 2011, they did a concert in Los Angeles’s Saban Theatre entitled “The Soul of Jewish Music,” benefiting the Bet Tzedek Holocaust Survivors Justice Network. Then, in what might be called a leap of faith, Sony Music approved Perlman’s idea to make a CD featuring them performing Jewish music. 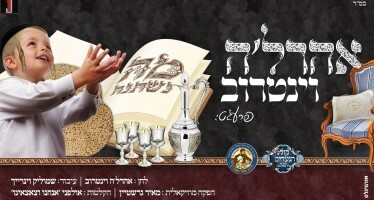 Entitled Eternal Echoes: Songs and Dances for the Soul, it’s due for release on September 4, shortly before the Yamim Noraim. Perlman’s Projects After sixty-plus years of playing the violin, Itzhak Perlman has become the undisputed world master, able to execute any type of music with apparent effortlessness. But beyond the virtuosity, what warms people to Perlman is his mentschlichkeit: This is a man who truly loves not only all sorts of music, but all sorts of people. Perlman and his family spend their summers in the Hamptons, in a sprawling, white clapboard house overlooking an enormous lawn bordered by flower gardens and fruit trees. No rickety bungalow, this, not with its sparkling swimming pool and spacious patio visible through the bright, yellow kitchen with cathedral ceilings, ceramic tile, and modern art. Perlman began playing the violin shortly after age four. “I wanted to play at three and a half, but I was too young,” he says. By the time he was 13, his family had moved to the US so he could pursue his musical studies. His prodigy status was cemented with an appearance on the Ed Sullivan Show. 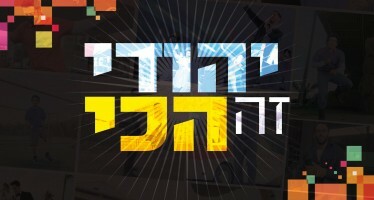 In Israel in the 1940s and ’50s, family entertainment centered around the radio. Perlman remembers affectionately listening to “the old Israeli standards,” as well as classical music — the incomparable Jascha Heifetz was his first violin idol — and chazzanus. “I was brought up on chazzanus,” he declares.